A turn-based strategy game, combining elements of survival, card game, and a gamebook. You arrive at a dark fantasy world, strongly inspired by the Slavic mythology, after the apocalypse. As one of eight Slavic deities, you take care of a small village. 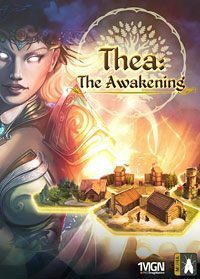 Thea: The Awakening is a rarely encountered mix of genres, which is a turn-based strategy at its core, but also contains elements of survival, as well as card game and gamebook. The setting in which the action takes place is unusual as well – it’s a dark fantasy world in the aftermath of an apocalypse, deeply rooted in Slavic mythology in terms of ambiance, creatures, etc. The game is a debut work of an independent team MuHa Games, founded in Oxford, but composed in large part of Poles (including developers involved in the Witcher series). At the beginning of the game we choose one of the eight Slavic deities with unique abilities, which we will control. Then we are transported to a vast, randomly generated map, the center of which is a little village under our custody, inhabited by a handful of survivors of a mysterious cataclysm that hit the world of Thea. Every man under our control has unique equipment and a set of coefficients and abilities. The essence of gameplay is to explore the magical land in a turn-based manner on a map divided into hexagonal fields, gather raw materials (including food necessary for survival), develop our settlement, construct various objects and cope with adversities, which take the form not only of monsters and evil spirits, but also illnesses, fires, etc. When a group of people assigned by us sets out to explore the world, they encounter various places and NPCs; these encounters involve the gamebook mechanics mentioned above (a total of over 200 random meetings). In addition, we must take into account random events that may e.g. affect our village. Each encounter is presented through a fairly extensive description, showing the situation in which we find ourselves, and several reactions to choose from. Thus we get involved in different situations, often with multiple threads. They determine the course of the game, so it looks different every time and can have a different ending. It is worth mentioning that Thea: The Awakening does not provide a classic role-playing campaign – each "scenario" is a full-fledged, hours-long adventure featuring a complete story. The above-mentioned card mechanics deserve a longer description. They are used to settle any contentious situation – not only traditional clashes with wild beasts and bandits, but also situations such as a danger to the village in a form of fire or curse, or even an attempt to convince someone to our arguments. During the clashes, our character and the adversity are represented by cards. Some of them are designed to fight directly "in the field", while the rest remain in reserve, supporting the clashing opponents with various powers and special actions. Thea: The Awakening was created on Unity 5 engine. Most of the gameplay takes place in a rather appealing, three-dimensional environment, but in many situations (especially during card skirmishes) we are accompanied by aesthetically pleasing, two-dimensional drawings. Review of Thea: The Awakening – Civilization in a Slavic setting? Slavic atmosphere and unusual mechanics that are difficult to assign to one genre – these are the most important aspects of Thea: The Awakening. The question is: are these interesting solutions complemented by good gameplay? Slavic mythology is rarely used theme. With the exception of The Witcher, we’d be hard-pressed to name a recently-made, successful game that was inspired by the old beliefs of this ethnic group. This is where Thea: The Awakening comes in.